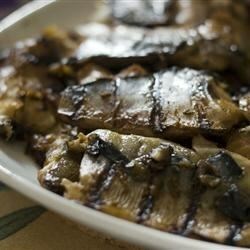 "Japanese marinade sauce gives a lovely taste and texture to broiled mackerel. Yellow tail, tuna or salmon are also good for this recipe. Easy, exotic!" Rinse fillets, and pat dry with paper towels. In a medium bowl, mix together the soy sauce, mirin, sugar and fresh ginger. Place fillets into the marinade, and let stand for at least 20 minutes. Preheat your ovens broiler, or an outdoor grill for high heat. Broil the fillets, basting occasionally, until the fish flakes easily with a fork, about 5 to 8 minutes. Serve with a lemon slice or long white radish slice as a garnish. Watch Chef John make a simple and delicious broiled herb-crusted salmon. This recipe worked great on salmon. I used some of the cooked sauce on white rice and it was delicious. The salmon turned out juicy and well cooked. Very good! I find mackerel very fatty, and this seemed to cut down on the greasy taste! Easy to prepare too! This was a great marinade for the mackerel! We absolutely loved it. We cooked the fish on the grill and it had an amazing taste. Thanks!